I'm a mom and I understand how busy we are. Somedays I really think the pile of laundry is going to overtake me. 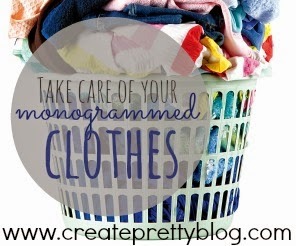 But I wanted to share a few tricks I've learned along the way with custom monogrammed and embroidered clothes. These clothes take a little bit of special care, but really they aren't high maintenance. Here are my tips as a mom monogrammer. Try to flip the shirts inside out. Especially where there is an applique. It simply protects the design from rubbing against other items. The easiest way to remember? Flip it inside out when your child takes the item off. Luke has a big head (not making fun- it's totally true) and he usually needs help getting it off so I go ahead and flip it while I pull it off. Always wash in cold water. Hand washing is ideal but HA! Aint nobody got time for that. I wash everything in cold to be sure. Also cold water helps the applique fabric not to shrink (keeping the design pretty). I always use Heat n Bond light on the backside of the applique fabrics. I always "heat seal" it before I send an item to a customer, but after multiple washings it tends to come "unglued". If you ever feel like the design fabric is wrinkling a very light ironing job will do. You MUST be careful when ironing so you don't melt the thread. Ask me how I know ;P Most times I use a piece of scrap fabric between the shirt and the iron and I use the tippy tip of the iron to get into the area. HnBL is great, but it doesn't stay stuck forever. Remember thread is either Polyester or Rayon so keep that in mind when you set the temperature on the iron. Drying. All the experts say don't. But come on right? I don't like how air dried clothes feel. There's something about being fluffed in the dryer. I keep the shirt inside out and try to dry it on low. I have an "eco" setting on my dryer and that's what I use the majority of the time. There's still a chance something may happen, so be careful! Be sure to check for safety of items. If they have an add on bow or ribbon loop or any other "add-on", check the add on frequently to be sure that it's still attached securely. I've recently started using "Tender Touch" on the back of my items. This is a soft covering that goes over the back of the design (either applique or monogram). Remember that this may wash off over time- no guarantees. Luke's Carter's and Gap shirts rub off eventually too. Nothing that gets washed and dried will stay put forever. If the tender touch falls off it will NOT harm the outfit or design in any way. It's always worth a shot to reattach it with an iron (on a low setting), but it can also go without. I appliqued and monogrammed for 3.5 years before using this product, so the item of clothing IS OK without it. It's just an added touch. Remember- they're KIDS clothes. They'll get dirty and that's ok. Many times I've been able to use shirts year after year. Also the quality of the shirt depends on the quality of the finished product which is why I have transitioned to high quality blanks. It makes a world of difference!